If a fire struck your shop in the middle of the night, would your business survive? What would you do first? And would your insurance cover the damage? Is your business protected from catastrophe? Robert Rising and Jacqueline Tellez, owners of New York Slab, found out the hard way, this past January. That’s when they got a 6:00 a.m. call alerting them that a four-alarm fire had ripped through the building that housed their furniture-making woodshop. The disaster didn’t seem real until they saw it on the news later that day. At first they were relieved when they learned that another tenant was responsible for the fire, but the big shock came after they learned their legal minimum limited liability insurance didn’t cover any of their losses. Limited liability insurance only covers the damage that businesses cause to others. Without content insurance the entrepreneurial couple got no support for the damage they suffered. Without work stoppage they also got no compensation for lost income. However, the agent was serious and told Tellez that NY Slab would have received some insurance payments if it had been responsible for the fire. When Rising finally got through the police barricades, he says it looked like a crime scene. All the furniture they were preparing for delivery was ruined. The equipment was flooded in over two feet of standing water. On top of that, he had a full-time staff of workers expecting to be paid — and no place to work. With their future hanging in the balance, Tellez and Rising went into full damage control mode. Rising and Tellez were surprised by just how understanding their customers were. Once they explained the problem, most clients were willing to extend their deadlines to allow Rising and Tellez to make good on their orders. In fact one new job came in when a customer read about the fire. He placed an order for 80 new park benches. The deposit from that order helped Rising and Tellez get back on their feet. Tellez and Rising also credit their other revenue streams with helping their business to stay afloat. 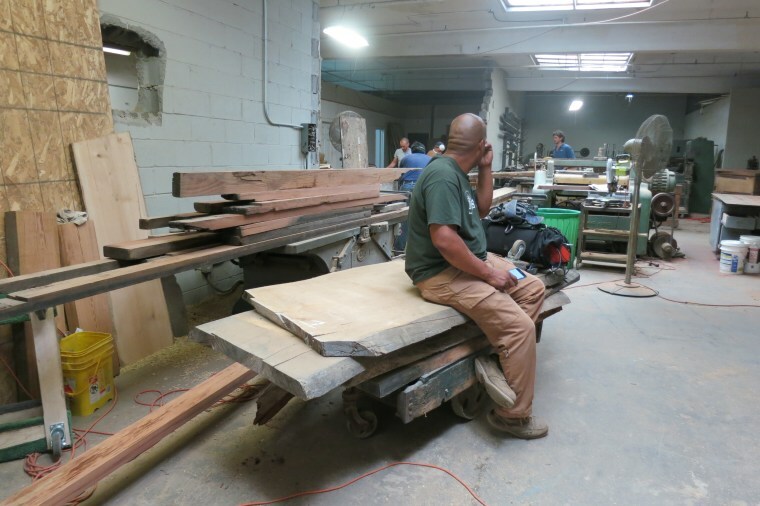 In addition to making furniture, NY Slab also salvages hundred-year-old timbers from demolished buildings and re-mills those old-growth beams into premium flooring and furniture-grade lumber. It also works with regional landscapers to salvage their unwanted logs to mill into furniture-grade boards. The income from these sources kept their staff working while Tellez and Rising worked together to rebuild the workshop and repair the damaged work. Today, Rising says that NY Slab is operating at about 60 percent. And while he’s optimistic about the future, he won’t let another fire or disaster threaten his livelihood. NY Slab has a full insurance policy just in case.